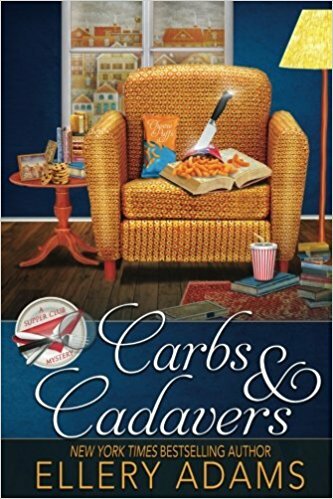 A quick cozy mystery read with a male point of view that is not recommended for readers that struggle with weight loss. James Henry’s ex-wife is marrying a rich lawyer. His mother has just died. He decides to quit his dream job as an English professor and move back home to take care of his father. He finds a job as the public librarian in his hometown of Quincy’s Gap, Virginia. When one of the library’s customers, Lindy the high school’s art teacher, wants to announce a new supper club for dieters, James decides to attend. Lindy, James, Lucy, Bennett and Gillian meet weekly for Sunday supper and begin a low carb diet together. Lindy and James just want moral support in their battle of the bulge. Lucy is a clerk in the Sheriff’s office who wants to be a Deputy. However, her excess weight prevents her from passing the physical. Bennett is a mailman, who wants to regain his former wrestler’s muscular form. Gillian is a vegetarian new age type who wants to fit into a tank top. They name their group the Flab Five. Oh, and former football star Brinkley Myers is murdered by bleeding out in the town’s bakery. Who stole the lone bottle of Coumadin, a blood thinner, in town? The police arrest Whitney, a part-time waitress in the local diner. The Flab Five decide to investigate. James is an interesting character. However, most of the other folks in Carbs & Cadavers are not fully formed but seem more like stereotypical placeholders. This may have been the author’s intention with the goal of moving to different character’s point of view in each book in the series. There are a few recipes in the book: Phony Mashed Potatoes made with cauliflower and Guiltless Crustless Pumpkin Pie along with a “Good” Carb Snack List. I enjoyed reading a cozy from a male point of view. The setting of Quincy’s Gap with its small town parades, haunted hayrides and helpful neighbors was great. However, some of the scenes didn’t seem real. A staunch vegetarian who goes on a low carb diet and begins eating meat while complaining extensively? A mail truck that can’t carry the weight of four overweight people without squealing tires and groaning axles? The attraction between James and Lucy seems one-sided and forced. Worst of all the murderer’s motive is absurd. A lot of the supposed humor is at the expense of thick people like splitting pants, gross underwear exposures and cheesy puff handprints indicating diet cheating. Creating a series about dieting would appear to be attractive to readers with their own weight issues so why is the author making fun of fat people? I know the author can write better. Her Books by the Bay Mysteries are one of my favorites. But I think an opportunity was missed here. Hopefully, a thicker writer will try to write a more empathetic mystery series about dieters. 1 star. Thanks to the publisher, Beyond the Page Publishing, and NetGalley for an advanced copy.